1. Are you a Registered Training Organisation? 2. The 3 hour class carries no formal assessment but the 5 hour courses does. How is knowledge assessed in the 5 hour course? Online learning is now a requirement for all students undertaking our 5 hour Accredited barista course from 1 January, 2017. Whilst it involves knowledge testing to be done prior to class and in your own time, it means that when you come to your class, it will be much more practical than it has been in the past. You will spend more time on the espresso machine practising what we are going to teach you in class. You will get your login details in your confirmation email once you enroll in the class. 3. Where do I go to attend the barista course? Our coffee school in Sydney is located in the heart of the city across the road from the Apple store on George St. If travelling on train, get off at Town Hall and walk down towards Circular Quay on George St for 2 blocks. Exact address: Level 10, The Dymocks Building, 428 George St, Sydney. Our coffee school in Melbourne is located up the Parliament and Chinatown end of Bourke St. Exact address: Shop 3A, Level 1 (top floor) Paramount Retail Centre, 108 Bourke St, Melbourne. Our coffee school in Newcaslte is located next door to NIB and opposite the new law courts on Hunter St. Exact address: Level 2, 376 Hunter St, Newcastle. 4. Do you have a dedicated booking office? YES. As we are Sydney's largest barista trainers we have a dedicated booking office next to our training room. You do not need to be worried about being turned away because a class is in progress or visiting at a specified time. We look forward to seeing you. 5. How do I pay for the barista class? Payments need to be made for our barista classes with a credit card online (our site is highly secure - payment is made via the Commonwealth Bank), or call us on 1300 838 962 and pay by credit card over the phone, or by coming to our Sydney office Mon-Fri 9am-5pm at the above address to pay by cash, EFTPOS or credit card. Bookings for our barista courses prior to the day of the course are essential. 6. What do I bring to the barista class? You must bring photo ID to class. Also please bring some writing material if you want to take any notes during the coffee course. Our coffee classes start promptly so don't be late! 7. What do I get when I graduate? You receive a professional barista certificate on the day that states what you have learnt. If you do our 5hr Accredited class you will also receive our nationally recognised Statement of Attainment bearing the units of competency SITHFAB005 Prepare and serve espresso coffee and SITXFSA001 Use hygienic practices for food safety. This is issued by CBD College (RTO# 91399). 8. How will I learn how to use the machine in 3 hours? With our unique barista training methods and hands-on practice, you will leave knowing how to use the coffee machine and will be able to walk up to any coffee machine and be able to operate it. Everybody has their own steam wand and group handle. There is no waiting around. In the case of the 5 hour accredited course, students will need to be able to follow and recall instructions and information provided by the trainer so that they can complete activities that will be assessed. The activities will include demonstrating practical skills competently and recording answers to written questions. Written questions are asked via multiple choice questions, true/false questions and short answer questions given in class. 11. 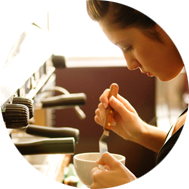 Is there an age limit for your Barista Courses? The age limit is 14 or above unless accompanied by an adult. The accompanying adult also has to pay full price for attending the course. 13. What do I get when I graduate? 14. Do I need to do anything before coming to my course? 15. What are my consumer rights? 16. What is a USI Number? 17. Do all students need a USI Number?